1. Preheat the oven to 200C / gas mark 6 and boil a kettle. Dissolve the creamed coconut in a jug with 300ml boiling water. 2. Rinse the black rice and place in a pan with 500ml boiling water and a pinch of sea salt. Simmer for 25-30 mins until cooked. 3. Cut the cauliflower into small florets, place in a bowl and mix with 1/2 tbsp oil and a sprinkle of sea salt. Place on a baking tray in the oven for 10-15 mins until golden. 4. Meanwhile, thinly slice the onion. Roughly chop the tomatoes and the coriander. 5. Heat a medium-sized pan with 1/2 tbsp oil on a medium heat and cook the onion for 5 mins until softened. Then stir in the tikka masala paste for 1 minute. Add the roasted cauliflower florets to the pan and stir to coat in the paste. 6. Drain the chickpeas and add to the pan along with the chopped tomatoes and creamed coconut. Simmer for 10 mins until the sauce has reduced. Then stir through half of the coriander and all the spinach and cook for a further minute until wilted. Drain the black rice. 7. 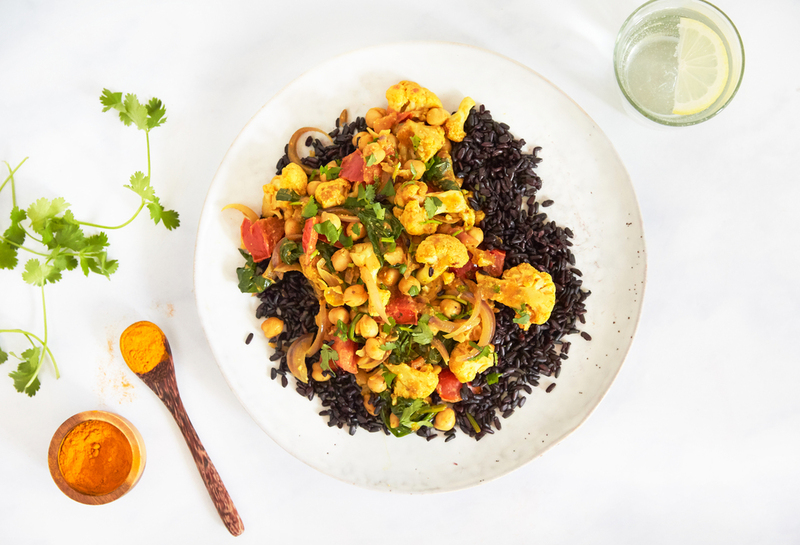 To serve, place the black rice on two warm plates and spoon over the cauliflower and chickpea masala. Sprinkle over the remaining coriander.